This article is about the Futurama character. 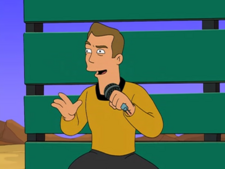 For the voice actor, see William Shatner. William Shatner is a Canadian actor best known for his role as James T. Kirk on the original Star Trek series and seven motion pictures. Along with other Star Trek cast members, he became a head in a jar after leaving the forbidden planet Omega 3 (4ACV11). George Takei's head later said Shatner couldn't pay him back (6ACV04). George Takei's head: I haven't heard such an eloquent speech since Bill Shatner explained why he couldn't pay me back. This page was last edited on 26 December 2015, at 18:16.